The Indian Chief Archer is a reproduction of an important weathervane that recently sold for $5.4 million at a Sotheby's auction. The original was in the Ford estate and was probably made by the J.L. Mott Ironworks in Chicago. 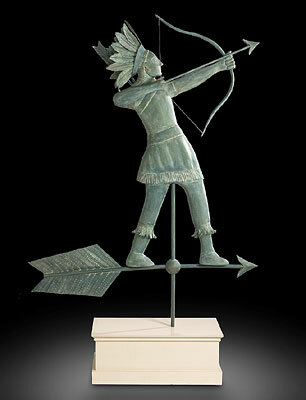 Standing about 7 feet tall, this reproduction is sculpted from pine, and maple with the headdress, pant fringes, quiver arrows and directional arrow made from copper. The entire piece has been dry-brushed with numerous layers of paint to give it an over all appearance of oxidized copper. It comes mounted on a wooden plinth, painted with a light grey coloration.